Earlier topic: Male & female plates for embossing...??? Does anybody still use these? 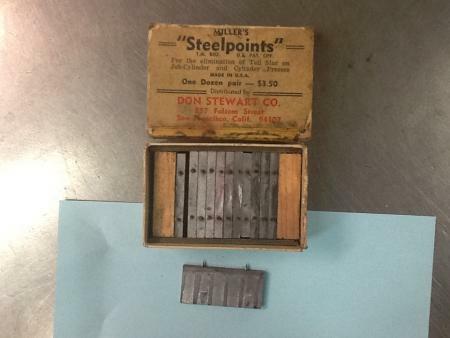 I’ve had this box of steelpoints around since day 1 and I haven’t used a cylinder press in decades. Yes, I use this style of points when there is little border at the tail so the image is close to the tail of the sheet. I feel like someone was on here looking for some recently. Were you interested in selling them? If they are for sale; I would very happily buy them! I have been looking for them. what is a set of these worth to someone? It looks to me like it wouldn’t be hard to make them. Take some wood about 12 or 18 points wide, drill holes all the way through, with a drill press and drill press vise so the holes would be straight. Find some nails which are just slightly larger in diameter than the holes which were drilled (or actually pick some thin nails and drill holes just slightly smaller than the nails, so they will be a press-fit). Dress the nail points on a grinder, if necessary. Cut the nails to the appropriate length, and press them in. jhenry — ok, a newbie here and I will bite, I have a few in a box I came across — how are they locked up and how are they functionally used to enable or prevent, sir? I still use steel points on my Miehle V-50. Used them last week to prevent a perf. from pulling out of the grippers. These points are locked in very near the tail of the form being printed so they support the sheet, not allowing it to slap down against the form early and leave a mark of the last line of type which then gets properly impressed just off the position of the prior (errant) mark. The points are designed to be just less than type-high, so in theory the points do not get inked. In practice, the points can potentially get inked if the rollers are not perfectly set, but at worst, they will just leave a pinpoint of ink near the tail of the sheet, much better than a slurred image of the last line as may occur without their use. Next time I have occasion to use them, I’ll take a photo and post it to give a clearer idea of their use. Perhaps if someone has them on press in the next few days, they might post a similar photo to keep the thread of the conversation going. thank you Mr. Henry, would like to see them locked up in position, is just one necessary positioned centered on the sheet at the tail? These were an absolutely essential item on the big Albert cylinder presses, due to a design fault the sheet was hardly controlled at all on the back (i.e. leave) couple of inches. Register went all over the place.